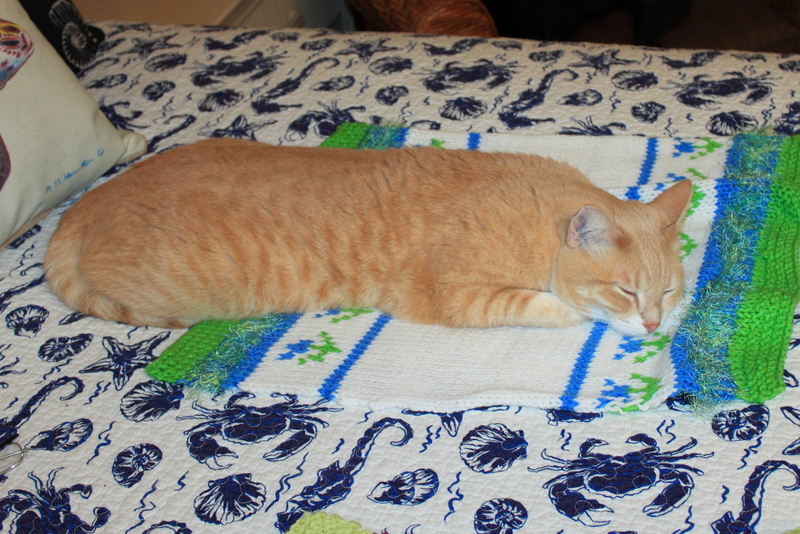 We adopted Chris in late 2009 from a shelter named Sav-R-Cats in Surfside, South Carolina (near Myrtle Beach). I met Chris while I was volunteering for Sav-R-Cats and worked with Shirley and Linda who are not only still there, but still keep up with Chris and his shenanigans. 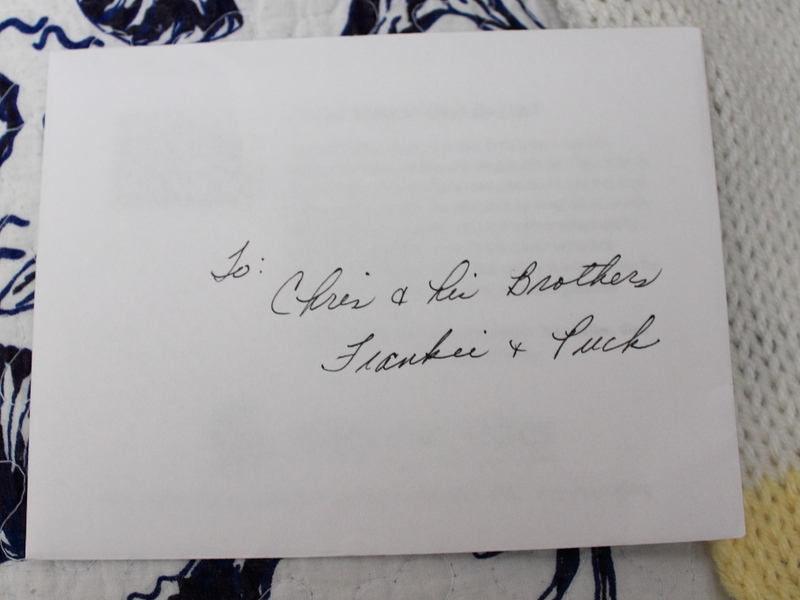 They decided to send Chris, Frankie and Puck a gift which arrived the other day. Frankie and Puck were interested right away, Chris was off doing his own thing and was not aware something new was in the house. 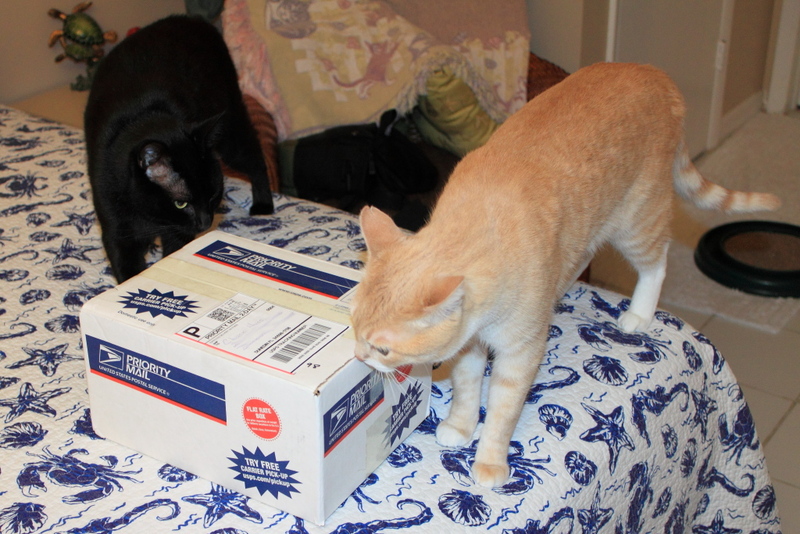 As soon as I opened it, the two of them were inspecting the contents. Soon Chris sensed something was up and was there in an instant to lend a paw in the inspection process. 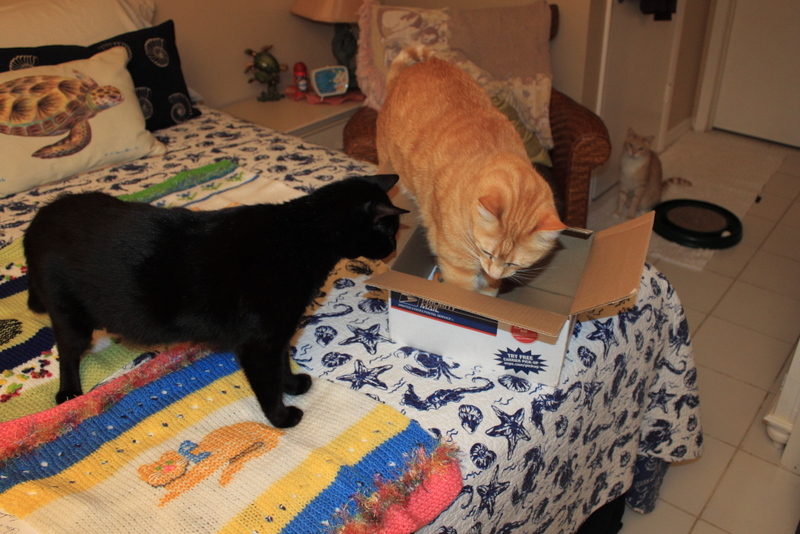 Even the box itself was thoroughly checked out. 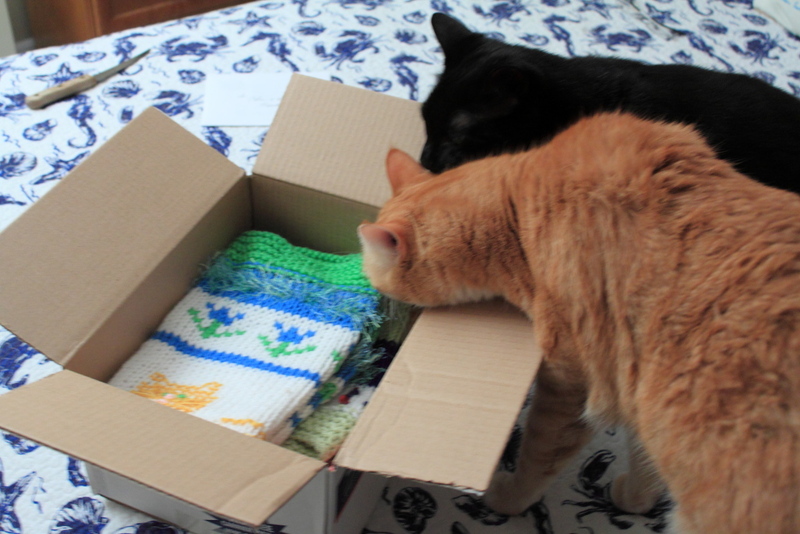 Inside the box were some lovely, handmade blankets, two with a gold cat and one with a black cat. One each for Chris, Frankie and Puck. But there was something else in the box. 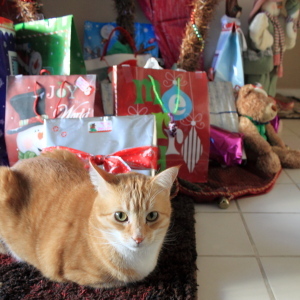 The blankets were already a great gift but there were also toys in the box. 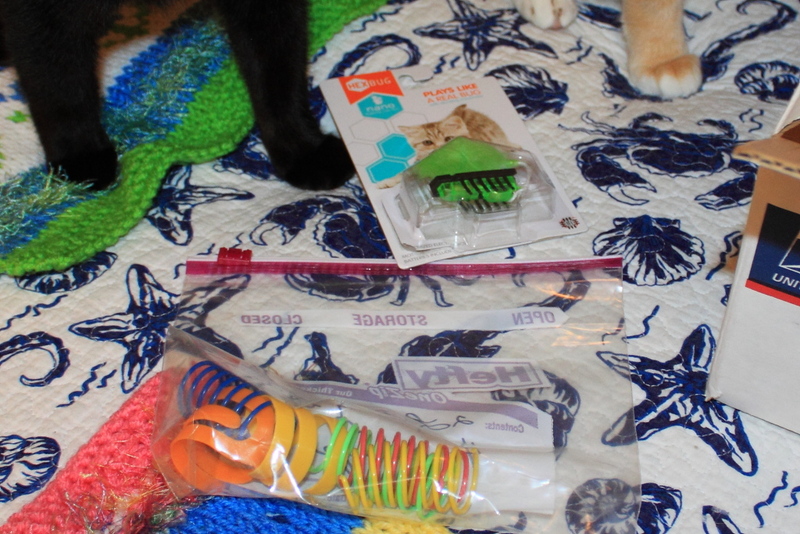 Some of the toys were labeled “Loony Loops” and “Springs.” There was a toy called a “Hexbug,” which looked interesting but I decided to save that for later. 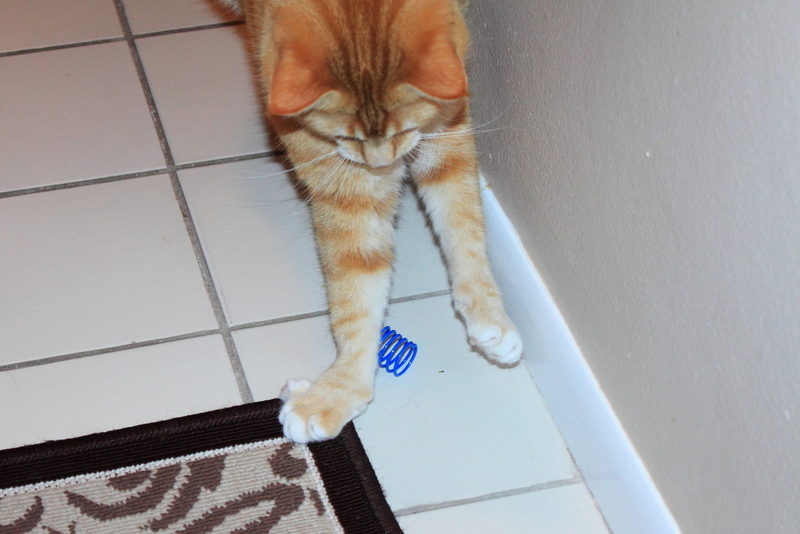 The first one I took out was a spring which Chris immediately started chasing around the house. 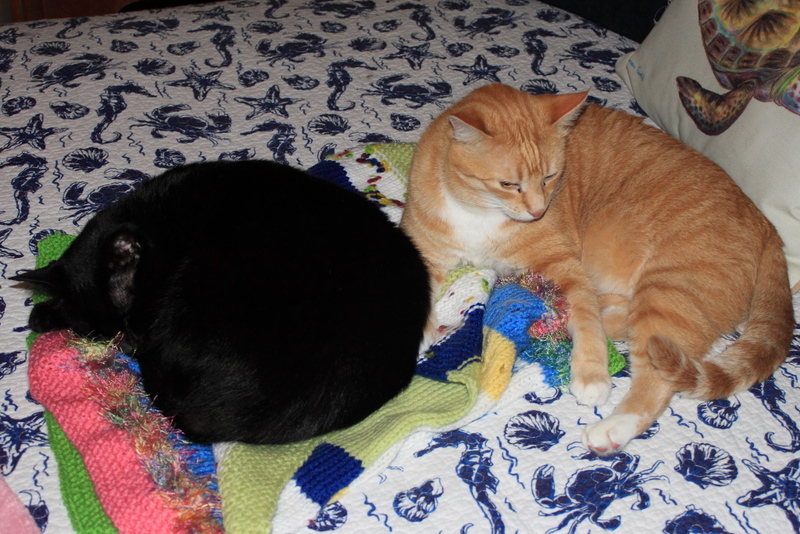 They loved the blankets too. There was also an envelope. 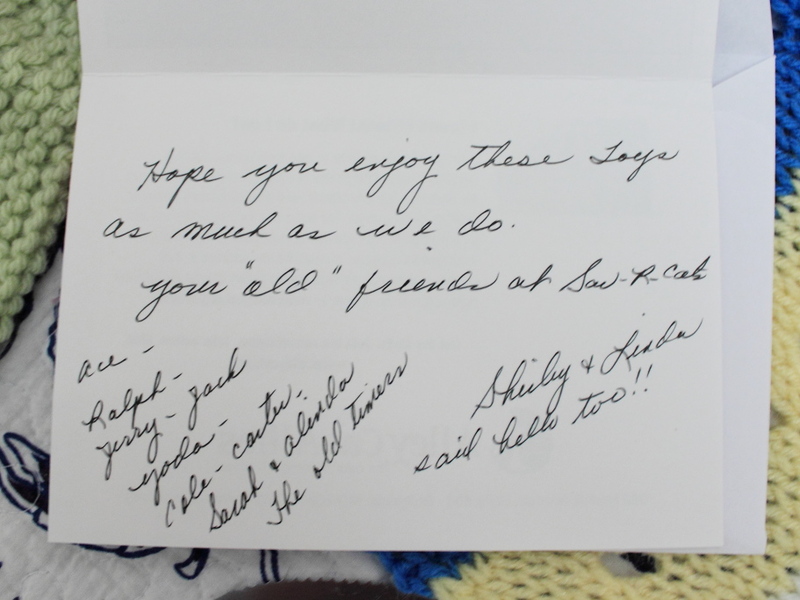 Inside was a nice card and note from Shirley, Linda and the cats at the shelter. 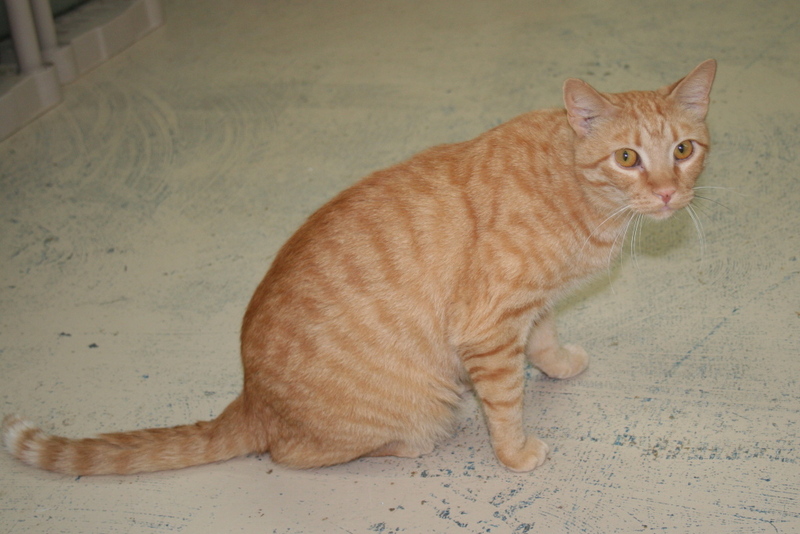 Sadly, many of the cats on the note were Chris’s shelter mates in 2009 and are still there. There is Ace, Ralph, Jack, Jerry and Yoda, Cole, Carter, Sarah and Alinda. 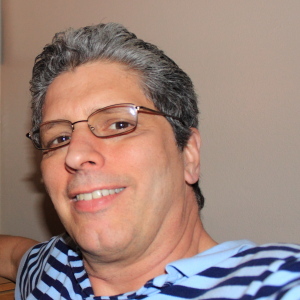 I took Pictures back then for Petfinder and remember some of those names, like Jerry and Yoda. Yoda and Jerry at Sav-r-Cats, dated October 3, 2009. 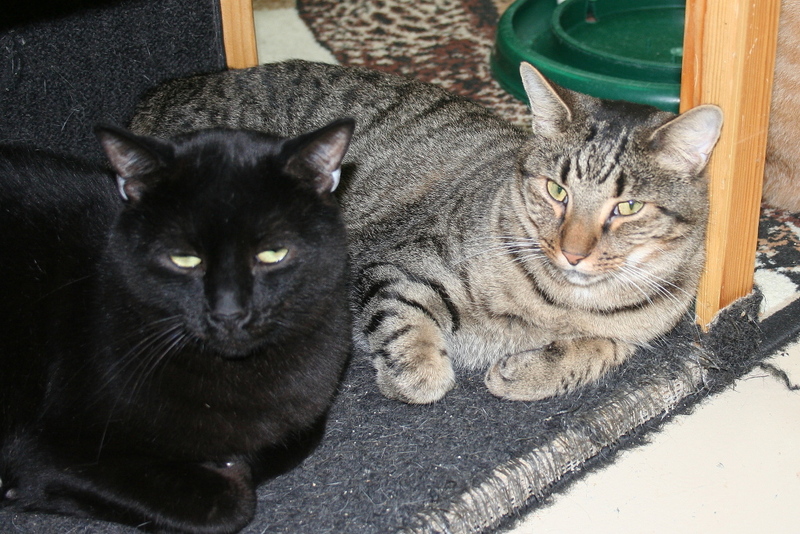 These two cats are best friends and must be adopted together, which may have made it more difficult for them. They have lived a good part of their lives in a shelter (Jerry since 2006) and could possibly die there without ever knowing a good home. Of course, they are treated well at the shelter but I would love to see these two and the other “old timers” find a loving home to live out their remaining days. 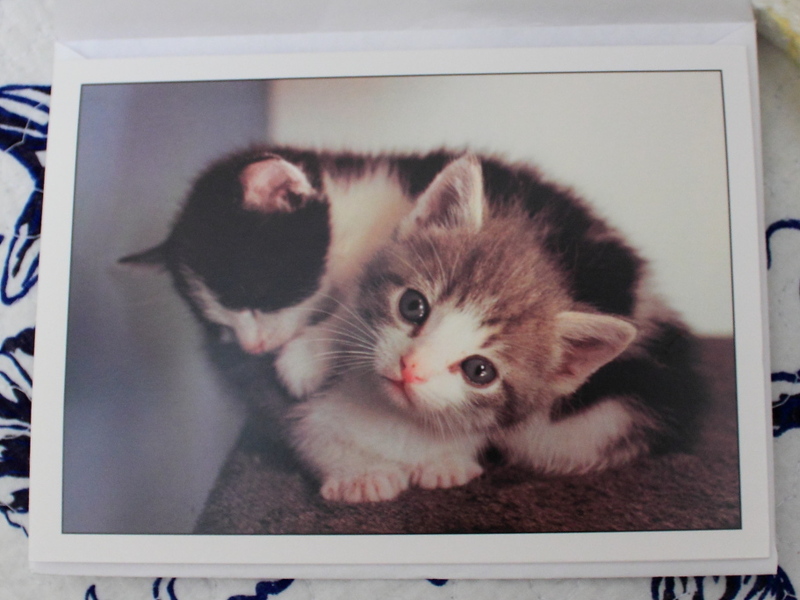 Another cat that I remember on the card is Sarah. It seems the males are more likely to be long-timers at a shelter but not always. 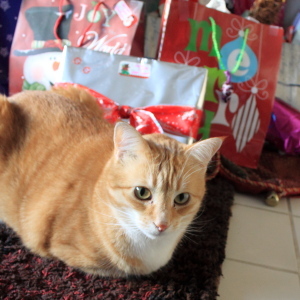 There is also Jack, who reminds me of our departed cat Tigger. 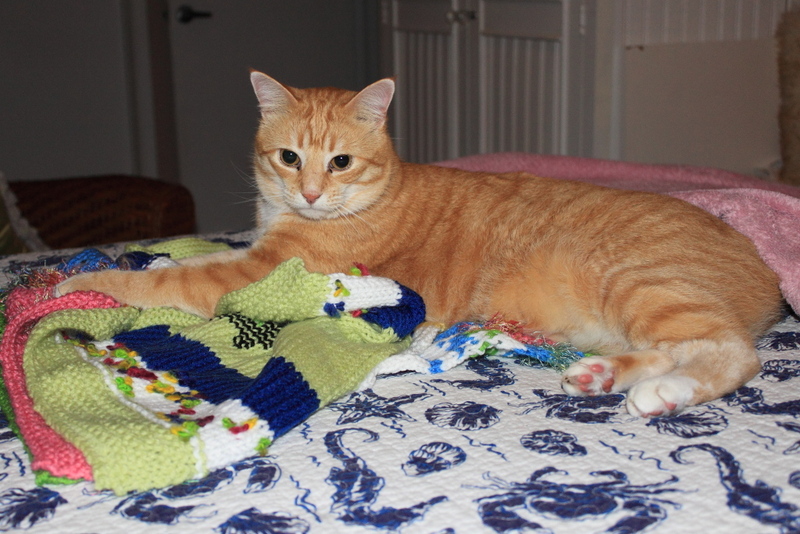 Jack, photo taken October 3, 2009. Not on the card is Hope, who I photographed in early 2010. Hope, dated February 11, 2010. 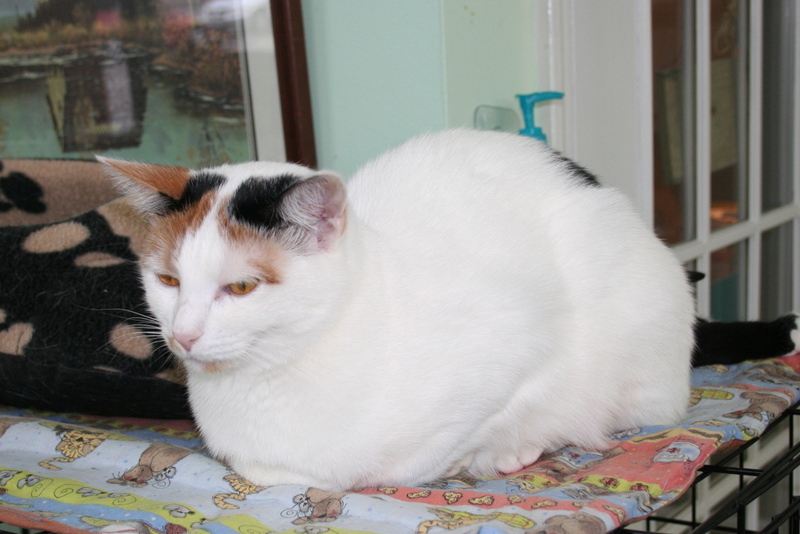 If anyone lives near Myrtle Beach, or know someone who does, and would like to help a cat or two that have been in a shelter too long, please contact Sav-R.Cats.com or check out their Petfinder page. 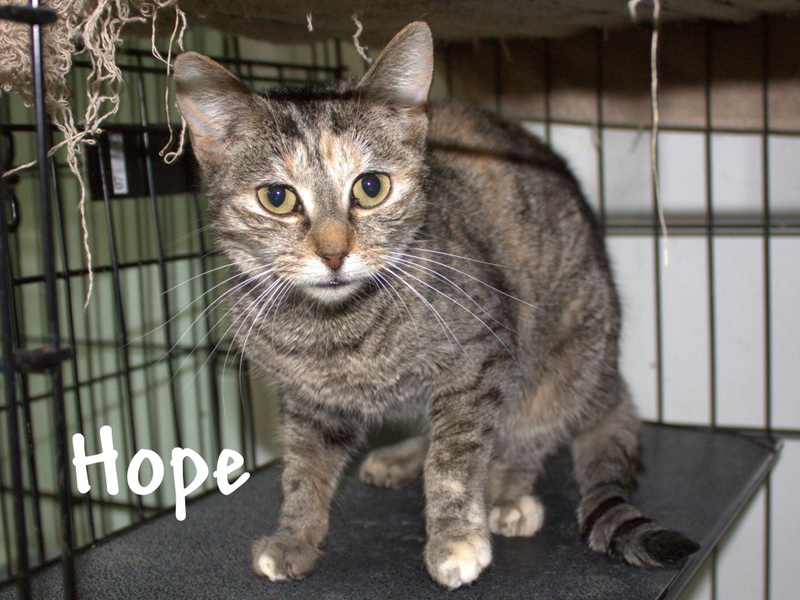 Update: It turns out that Hope was adopted so that is good news. 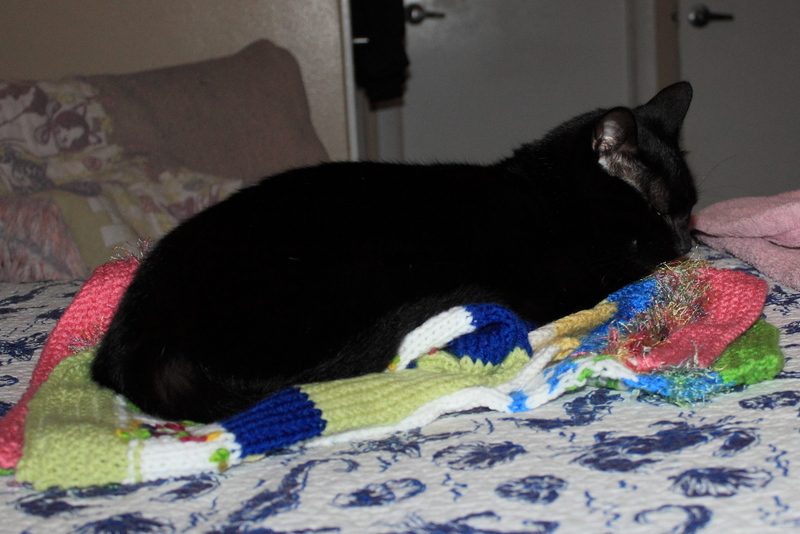 This entry was posted in Uncategorized and tagged adopt, blanket, Cats, gift, Myrtle Beach, Pets, Sav-R-Cats, Shelter, toys on February 15, 2015 by Charles Huss. 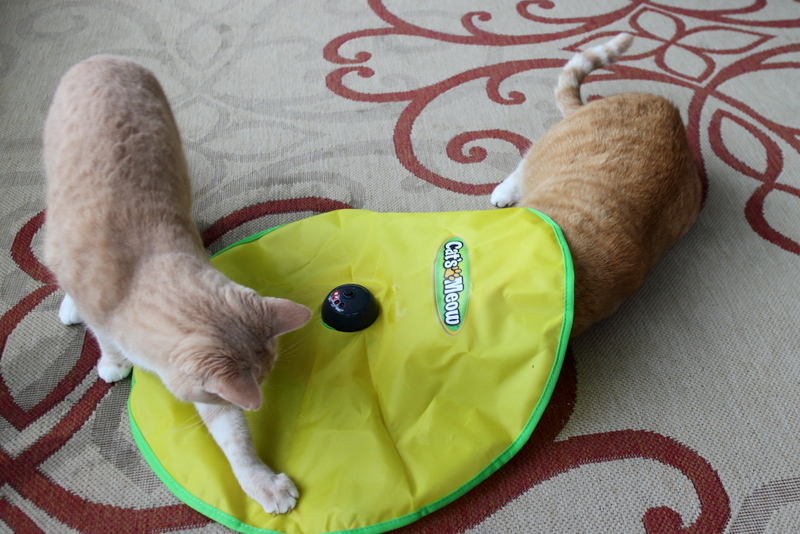 A little over a year ago we introduced our cats to the “Cat’s Meow” cat toy (read about it here). 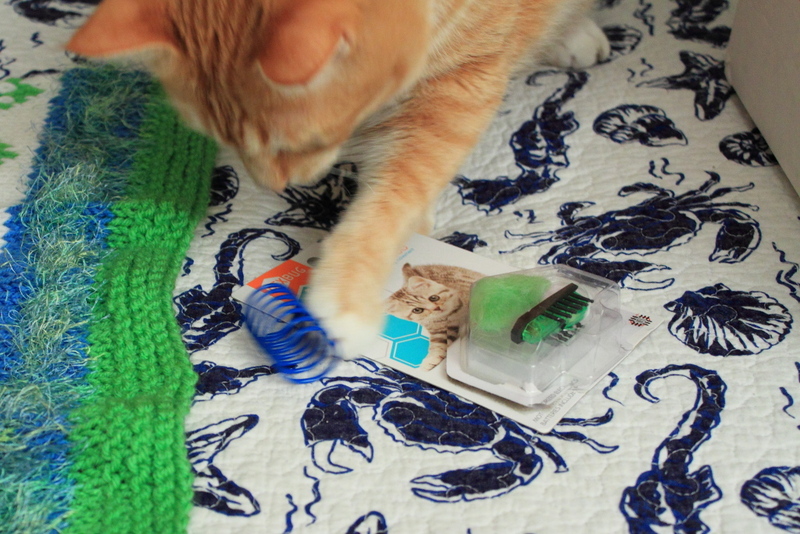 They loved that toy but we were not the best at remembering to take it out and turn it on. We ended up giving it to someone with more cats than us. This Christmas we decided to buy them another one and hopefully be better about using it. Frankie was not around for the last one and found it quite fascinating, as did Chris. Puck missed out on the first round of playing because he was hiding under the bed, but he did get a paw in there a little later. Chris had it figured out pretty quickly and was under the cover working at the mechanism. 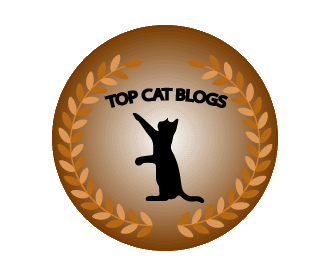 This entry was posted in Uncategorized and tagged cat toy, cat's meow, Christmas, cute, funny, gift on December 27, 2014 by Charles Huss. It’s too early, Chris. Christmas is more than a week away. 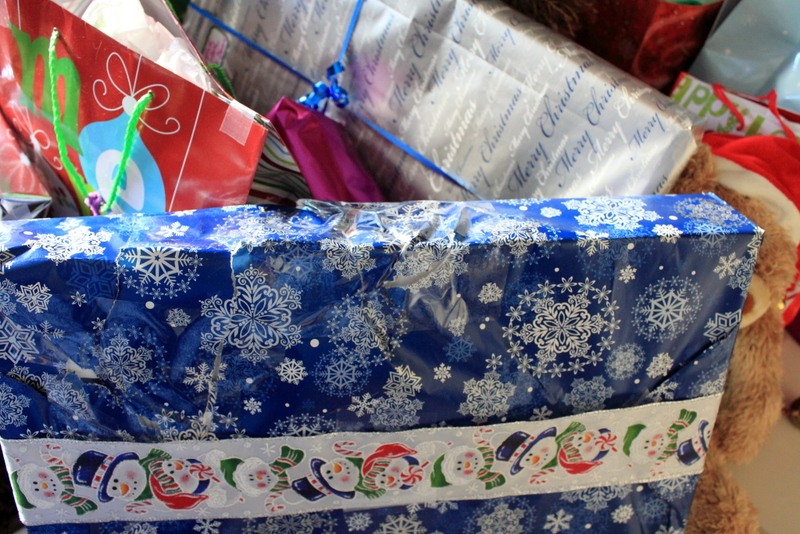 Besides, you already tried opening a present that wasn’t yours and Rose had to tape it back together. That wasn’t me. That was… uh… Puck, I mean Frankie. It doesn’t matter. If you open it now you will ruin the surprise. 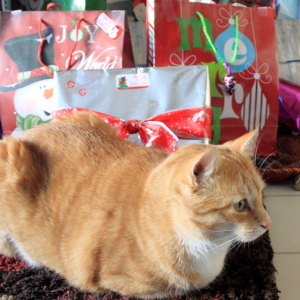 Besides, how do you even know you have a present? 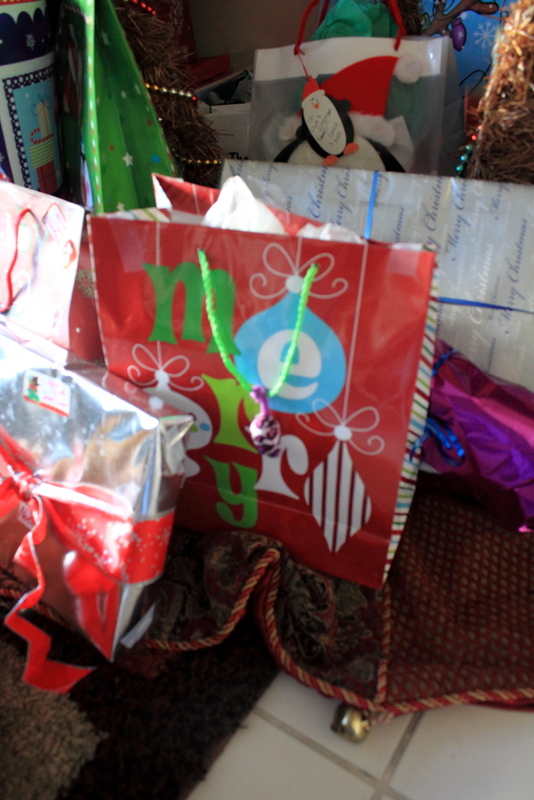 Who else would have a present with mice tied to the gift bag? Good point, but you still have to wait. How about a little catnip then? This entry was posted in Uncategorized and tagged Christmas, funny, gift on December 16, 2014 by Charles Huss. It was a small snake, perhaps nine or ten inches long, and it was on the ground trying to escape but Chris and Puck had it corralled. I tried to grab it, but I wanted to pick it up near the head so it wouldn’t bite me. That slight hesitation gave Chris enough time to pick it up and run with it. It then became a game of keep-away. I quickly got tired of the game and picked up Chris, with the snake in his mouth, and carried him onto the patio. I then held him down near the outside door until he dropped the snake. When he did, I pushed the snake under the door to the outside. Done… at least that is what I thought. As soon as I let Chris go he ran to the door, reached as far under it as he could, and pulled the snake back inside. Bad cat! I had to go through it again. This time I held Chris down until he dropped it and then left the snake alone and put Chris in the house. I then picked up the snake, which was no longer moving, and threw it outside. If Rose wasn’t there I might have just let him eat it so the lost life would not be wasted. Later I wondered why he always has to bring his catch into the house. Rose said he is giving us a gift. 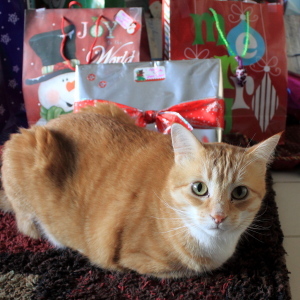 I am well aware of cats bringing dead animals to their owners as gifts, but when they bring it in and then play keep-away, it is not a gift. 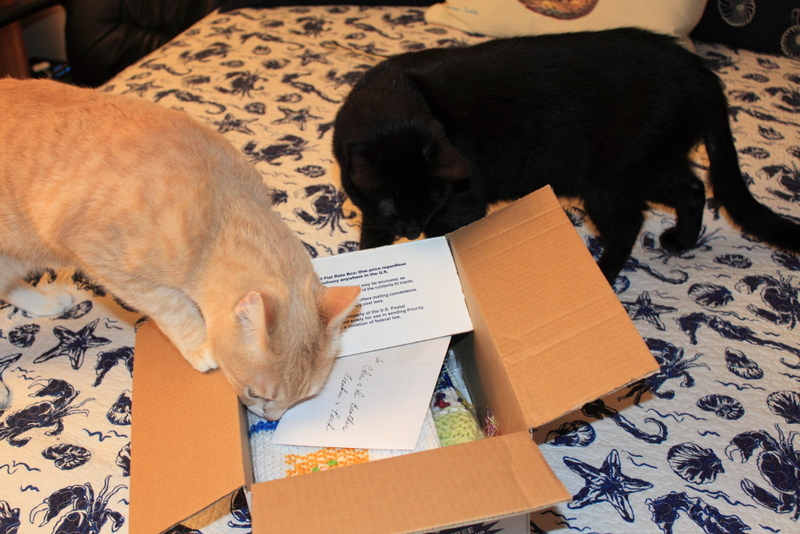 This entry was posted in Uncategorized and tagged Bad Cat, gift, Patio, snake on May 16, 2013 by Charles Huss.